I know some of you may consider this blasphemy, but I don't really like chocolate chip cookies all that much. When I do eat them, I actually prefer a firmer, more crumbly cookie. 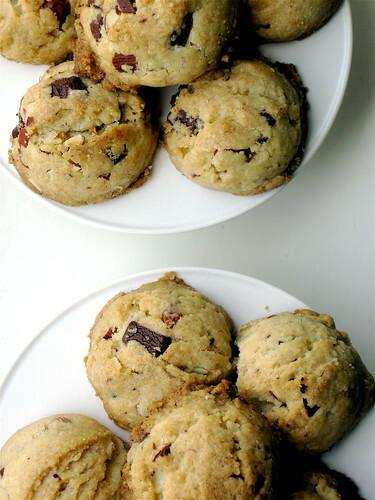 So many people love a soft, pillowy cookie studded with milk chocolate chips. Simple and comforting. Of course I wouldn't pass up one of those if it was in front of me, but I like mine a little more grown up. Swap the milk chocolate chips for shards of super dark chocolate. Throw in a handful of toasted almonds. Brown the butter to make it toasty and complex. Trade the traditional vanilla extract for almond extract (it makes them taste like cookie dough!) Make them a tiny bit smaller- because then the calories don't count, of course. And bake them until they are golden, crunchy, and irresistible. I took a recipe for chocolate hazelnut drops from Homemade by Clodagh McKenna and tweaked it a bit. I was immediately drawn to the recipe because she describes the way the cookies crumble. I couldn't resist. Each one of her recipes is accompanied by a short but engaging headnote, and the photography is lovely. The recipes aren't half bad either! I haven't made anything from the book yet that hasn't been a home run. 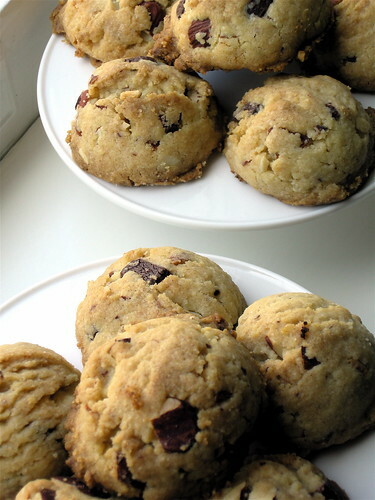 In fact, I'm actually craving one of these now....even though they are chocolate chip cookies. Preheat the oven to 350 degrees. Brown the butter in a large pan until it is a deep, honey color and is fragrant. Allow to cool and solidify. Beat the butter and sugar together until smooth and creamy. Beat in the almond extract. Whisk the flour, baking powder, and salt together in a bowl. Mix the flour mixture into the butter mixture. Fold in the chocolate and almonds. 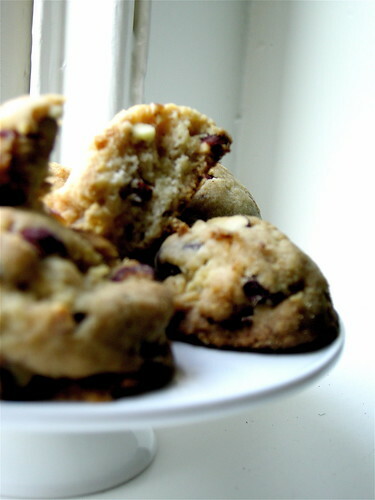 Drop tablespoon-sized balls of the dough onto baking sheets lined with parchment paper. Bake for 13-15 minutes until they are light golden brown and firm to the touch. Transfer to a wire rack to cool. 1. after the butter is browned and is cooling, how long should it cool for? Am I waiting for it to be firm and hard or just solidified? 2. Am I CREAMING the butter with sugar? 3. What rack am I cooking the cookies on? Middle? 4. Should I freeze the dough for a bit? I read somewhere that this is a secret used by top pastry chefs to make the best cookies? If so, how long? ?